Skincare RX carries La Roche Posay Skincare, and so much more! OOTD- Tick tock tick tock! I came I saw I conquered!!! OOTD- Southward and then stop! BTW I am so excited Breaking Dawn comes out in 2 more days!!! Now if I can just find something to wear! You look amazing in the bright cardigan! Tricia, you always look adorable! 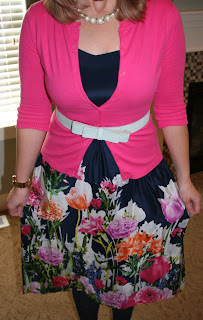 Love the bright cardigan and floral dress combo :) We are going out for Black Friday too, crazy! I love that dress! And can't wait for Breaking Dawn too! You look so beautiful! I love the bright colors. It is very dreary where I am so seeing your outfit brightened my day. Very Pretty!! I like the pop of pink on top. Great cardigan. I love the bright and cheerful pink!!! I'm also excited for Breaking Dawn. Can't wait! What a cheerful cardigan! I wasn't excited about the clothing markdowns, but was happy to pick up the colorblocked oxfords. Such gorgeous colors, Tricia! I was a bit disappointed in Anthro's sale as well, though I think I'll get a PA on the Glossed Loafers (I found them in store for $80 on Sunday, but now my wishlist shows them as $50 -- hooray!!!). I'm thinking of skipping Anthro on Black Friday as well. I desperately need a new computer so I might be braving the electronics stores on BF. Oh, the horror!